Alfonso Cuarón’s “Children of Men” is an anti-thesis of the modern Hollywood movie dystopia, an endeavor in which the image of a condemned human civilization contains no gloss, depends on nothing proverbial, and insists on taking paths so seldom traveled that we often wonder if it knows just how dangerous or challenging the unpaved roads can be. 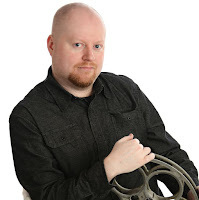 The movie doesn’t even have safety nets to fall back on, other than the background notion that its director’s sly and unusual style perhaps makes him ideal for assuming control over this rather heavy and morally-intricate source material. Whereas most filmmakers might broach the P.D. 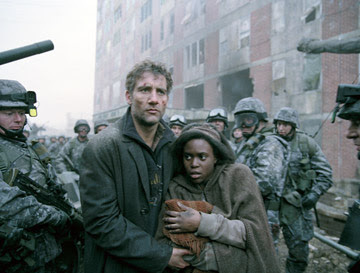 James novel “The Children of Men” with a straightforward or assertive attitude, here is a guy who knows it takes not just an analytical slant for the material to work, but also confidence in the prospect of it being obscure on formula and drab in its emotional thrust. Needless to say, he finds the precise chords required of it and doesn’t even bat an eyelash in the process. The very soul of the film scoffs at the expectation of being conventional or formulaic. Several, including the ones who profess to be aficionados of post-apocalyptic concepts in the movies, might encounter strokes of pessimism at the unforgiving onslaught that the movie chooses to direct at its subjects. It is nihilism at its most brutal, reluctant to see any faith in mankind beyond a random act of kindness, and dedicated to the view that fate has dealt the appropriate cards to all those involved in the matter. What makes the movie so much more jarring than we anticipate lies entirely in the stalwart foundation. Every action, every behavior, every piece of dialogue is precise, its thrust enabled by groundwork that knows and believes everything it discloses to its viewers. We are not simply there to be told a story or to be absorbed by ideals in a world not too unlike our own; we are carried into the matter as if we stake a claim to the outcome. “Children of Men” is a movie about us, but a movie about us that forces you to deal head-on with the reality that we are our own worst enemies. The story’s protagonist, a reformed government protester-turned-official named Theo Faron, steps into the movie like it is a warm bath approaching boiling point. He is played here by Clive Owen, in a role that demands a certain detachment from emotion, despite its character’s history with an emotionally traumatizing past. At the opening of the picture, Theo is in a passive comfort zone with his surroundings, plodding around in a London not too far into the future that is but one of many places, we gather, feeling the after-effects of a wide-spread catastrophe eating away at the remnants of our being. Years before, we are told, women in all corners of the world, all segments of society, suddenly stopped giving birth to children. Scientists, thinkers and common men alike remain baffled, stumped and intrigued by the event decades after it has come to pass, and the event has given birth to a future in which man has reverted back to his barbaric, primitive nature in order to counter-balance his essence as a creature in pursuit of perseverance. In the case of those more civilized, such as Theo, the concept of living is basically just an every-day action, with no sense of progress or purpose. Survival, it appears, means little in a world where everyone will be forced to share the same fate. This “human project,” an establishment spoken of with twinkles in the eyes of those who mention it, is an off-camera sanctuary in a time of discontent; though we never experience or comprehend its importance (nor, for that matter, are we sure that it actually exists), the mere mention of the place is obligatory to the plot, otherwise the dogged hope for anyone finding light at the end of the jagged tunnel would be a pointless and naïve prospect. It is the only source of light for these characters, and their pursuit of it enriches the means by which they attempt to arrive at it, including the stealing, cheating, back-stabbing and (in some cases) murdering they have to do in order to make it that far. What does it exactly contain that is of such stirring importance? The old and wise Jasper Palmer (Michael Caine) speaks of it as if it was a utopian object in a dystopian age, resistant to barbarianism and protected by those who work night and day looking for answers – and therefore solutions – to the predicament that earth’s superior race is currently in. The screenplay is a narrative marvel, fueled by underlying themes that would inspire all kinds of provoking discussions in most college psychology courses. How uncommon it is for a premise of any nature, let alone this one, to pay so much attention to subtle details and character motives in such an utterly thorough manner; whenever it has something to say, it says it with a profound and distinctive voice, and often with strokes that are a lot more precise than we expect them to be. Characters are explored down to the finest of details, and the actors who occupy the roles genuinely seem both engaged and dedicated to the material they are associated with. Caine is especially effective as Palmer, the aged friend of Theo’s who isolates he and his wife away from ordinary civilization not simply because it’s easier, but because it keeps them away from a reality that would shatter the perceptions of humanity they still cling to in a time of discontent. The movie is not for everyone. Cynics, visual enthusiasts, casual moviegoers and perhaps even aspiring filmmakers are going to find the substance heavy-handed or even overemphasized, and their frustration with the film would not merely end with the notion that it leads them completely off the paved roads and into a wilderness in order to stress all the points. But what it abandons in formula, it makes up for in scope and social relevance. This is a human drama at its most thought-provoking, the kind of movie that refuses to sugar-coat the obvious and give us the images that we often beg for but are seldom ready to deal with: the ones that show us just how cold, just how cruel, man really is when it comes to looking out for his comrades in a time of chaos and disorder. The key to keeping it from being entirely pessimistic or tragic lies in its ability to never lose sight of the light, no matter how incessant the shadows are in the meantime.